Babies, I am learning, as more and more of our friends have them, do not care about your carefully constructed plans for their arrival. They do not care if you’ve decided they will only wear cloth or Seventh Generation diapers; if it’s not working for them, they’ll be sure to let you know. Our friends Amanda and Quentin hosted us for a fabulous vegetarian Mexican meal at their house in August. Amanda was due in mid-October, and we heard about their wonderful midwife they had chosen, the birthing center across from the hospital where Amanda would birth their son. We also discussed their plans for spending the last few weeks of September and early October cooking freezable meals to be eaten at a later date, because cooking with newborn babies is not something that happens. Well, as it turned out, Miles Timothy had other plans. 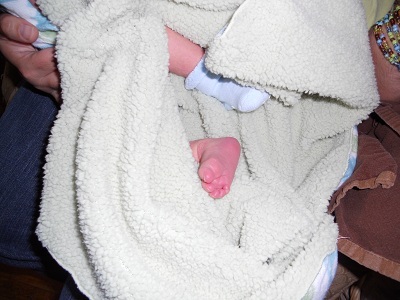 He zipped into the world, at one in the morning on September 29th, in their bedroom! 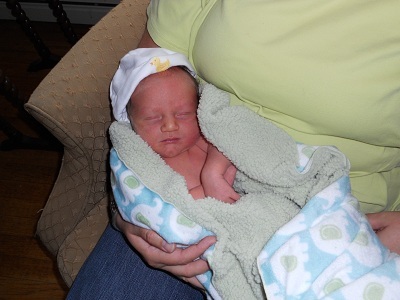 Practically perfect in every way, Miles, and his new mother and father – who delivered him! – were escorted to the hospital by some very nice firefighters. Everything worked out, although Miles’s surprise entrance meant that all those meals that were to be cooked before his arrival never got made. Knowing their time was going to be limited for the next few, well, 18 or so years, I spent a little time on Sunday whipping together some freezable meals for the new parents. Amanda is a vegetarian, so I felt that making a casserole, although filling and definitely freezable, wouldn’t necessarily have the protein she’d be needing. Although some babies have trouble digesting their mother’s milk if she’s eaten legumes, I decided to go with chickpeas and brown rice. Rice, as well as quinoa, freezes and reheats without any trouble. So when I started making the dish, I tossed a few cups of brown rice with water, a ratio of 3:1, in the rice cooker. Easy peasy. I dug around my cookbooks for a good recipe for something chickpea-based, but came up short. As it turns out, Deb from Smitten Kitchen, went through the same chana masala quest a few years ago and ended up blending a few recipes. I used hers with a few adaptations. In order to drop the temperature of the dishes without having them sit out and collect bacteria, I placed the cooking vessels in ice water. After the chickpeas and rice were cooled down, I placed them into freezable plastic containers, and brought them to the new parents. We had a quick visit and got to meet Miles in all his perfect tininess. Adapted from a Deb from Smitten Kitchen, who adapted it from a Madhur Jaffrey recipe, which had also been adapted. This was a perfect pantry recipe, as I had everything on hand. Heat oil in a large skillet. Add onion, garlic, ginger and pepper and sauté over medium heat until browned, about 7 minutes. Turn heat down to medium-low and add the coriander, cumin, cayenne, turmeric, paprika and garam masala. Cook onion mixture with spices for a minute or two, then add the tomatoes and any accumulated juices, scraping up any bits that have stuck to the pan. Add the water and chickpeas. Simmer uncovered for 10 minutes, then stir in salt and lemon juice. 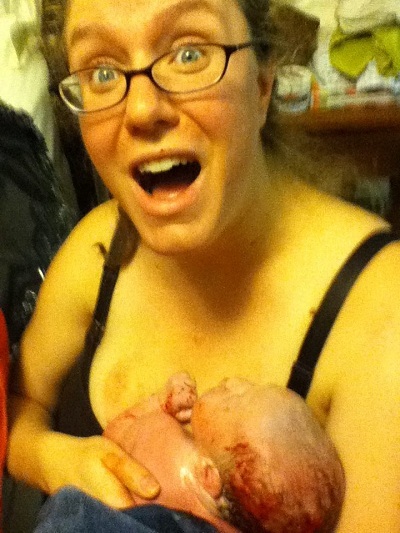 Babies! What a wonderful way to start the new year. And how lovely for the new parents that they have such caring friends. Btw- if you would like another great chickpea recipe- I’ve got one with tomatoes, garlic, chili and a load of cilantro. It’s quite good. A perfect gift, I am sure it will be much appreciated. Congratulations to your friends, that’s quite a story! I love the expression on her face…looks about right! What a wonderful surprise! Glad you were able to whip up a good meal for them–sounds easy, and delicious! I must say, that looks pretty healthy and organic. Also, congratulations to your friends! Welcome to the world, Miles! 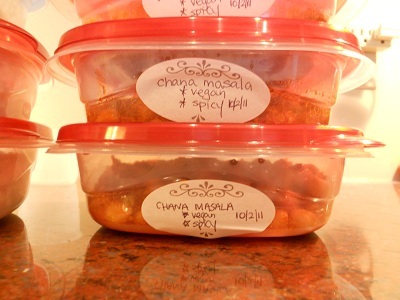 What a great chana masala recipe for any occasion. I’m sure it was greatly appreciated in this case! 6 months later and I’m just now getting around to posting a big THANK YOU for the delicious food! It was perfect and very easy to heat up when needed. I can’t believe how tiny Miles looks in these photos, as he is now a giant, thanks, in part, to your delicious cooking and recipes. Amanda, it was our pleasure to help. And yes, I think Miles is the biggest 6 month-old I’ve ever met. Such a cutie-pie, to boot.